While planning my trip to Portland and casting about for places to go and people to see, a wise man — and, incidentally, a specialty coffee luminary — steered me in a direction I wouldn’t have expected, saying, “You know, there’s more to life than coffee.” After I picked myself up from the floor — the earth doesn’t often shake in Vermont, after all, and the experience threw me a bit — I turned the idea over in my mind. Is it possible I’ve crossed an invisible line? Have I become obsessed with the bean? Maybe. Smitten, certainly. But obsessed? The idea gave me pause… enough to think a little more broadly about where I’d like to go while in P-town. And, really, I didn’t have to think about it at all. My feet already were already taking me to Powell’s Books. Books are my first love, and for years Powell’s Books has been the center of my book lovin’ universe. Oh sure, I flirt with Amazon, too — who doesn’t? — but when it comes to trying to get my mitts on a hard-to-find or out-of-print title, Powell’s has always been there for me. My prized shelf of Pratchett 1st Editions? All of ’em from Powell’s. Fifty-year-old coffee reference works? Powell’s again. Most any book I might care to buy at “gently used” prices? 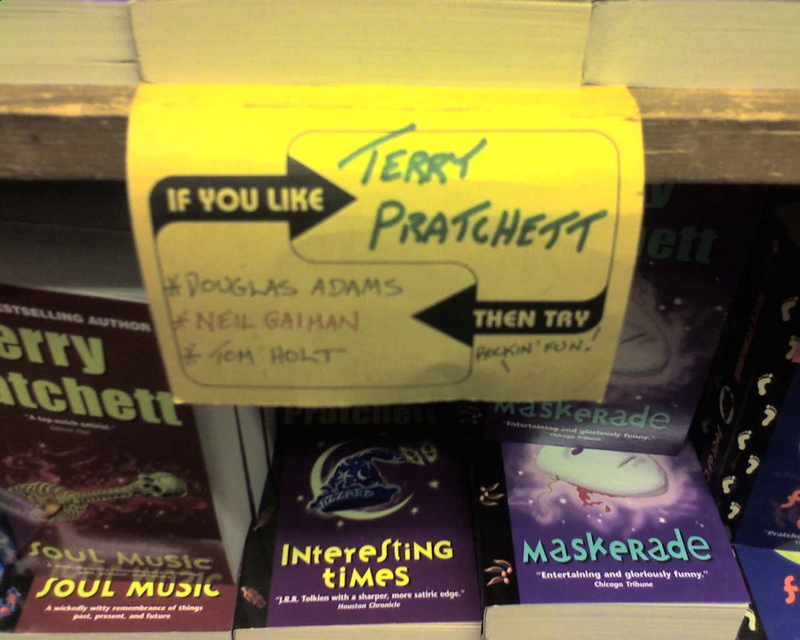 Powell’s. More, Powell’s has always helped me discover new authors I might never have heard of otherwise; their “hosted bookshelves” and staff picks consistently beat out Amazon’s recommendation engine, which seems to me too trendy, and too much based on publishers’ lists and not readers’ experience. 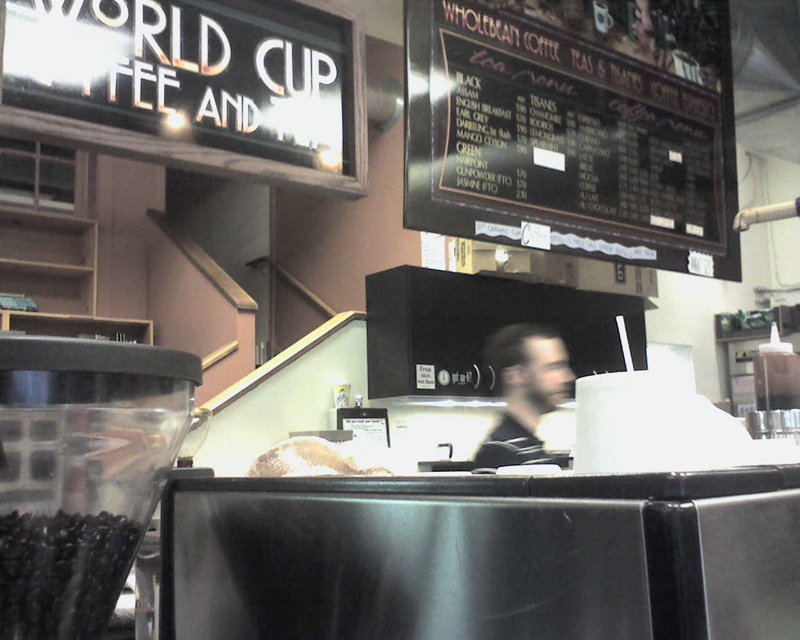 Of course, this being Portland, they have a coffee shop. It’s not the same as last I visited (which as I recall was the very last day of that coffee shop’s 30-year run… and I’m sure I wrote about that elsewhere on Bloggle but can’t find it). Still, they served a passable cup, and a pretty good sandwich, too, which is good ’cause hours of browsing requires sustenance. Should you find yourself in Portland and have a desire to at once make your wallet lighter and your luggage heavier, I recommend Powell’s. Or, if you wanna soak up the atmosphere of one and a half million books and a bunch of folks what love ’em, I recommend it so much the better.